Scott Hend put this shot off the grandstand and onto the green. An Australian pro’s creative shotmaking paid off in a big way this weekend. 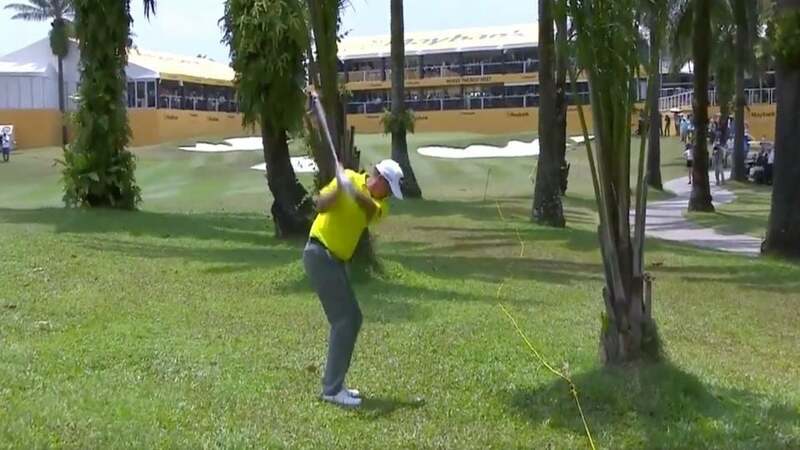 Scott Hend, who was playing in the Maybank Championship in Malaysia, was on the 18th and final hole of his third round on Saturday when things got interesting. Standing at the par-5 18th at 10-under for the entire tournament, Hend shanked his second shot into some trees. As a result, he was set up with a difficult third shot amongst the trees to get to the green. This is where Hend got creative. Instead of going with a lofted shot high over the trees to reach the green, he decided to go low to eliminate the risk of his shot hitting the trees or landing in one of the frontside bunkers. According to the broadcast, players had been practicing the trick shot during the week. And judging from Hend’s Twitter, it sure sounds like he meant to hit the grandstand behind the green. Played that way…. 121m to base of grandstand….. play a 140m shot low into the boards and see if it will bounce back…. 🤷🏻‍♂️🤷🏻‍♂️🤷🏻‍♂️ seemed to work out ok. My caddie bounced many balls off the stand testing the bounce during practice. The shot seemed to help Hend out greatly, as he ended up shooting 5-under 67 for his third round to move into a tie for fourth. He would then follow that up with another 5-under 67 performance during Sunday’s final round to beat out Spain’s Nacho Elvira, the leader after 54 holes, in a playoff to win the Maybank Championship at 15-under. Hend’s win was his third on the European Tour and 15th of his professional career, as his most recent victory came in 2016.